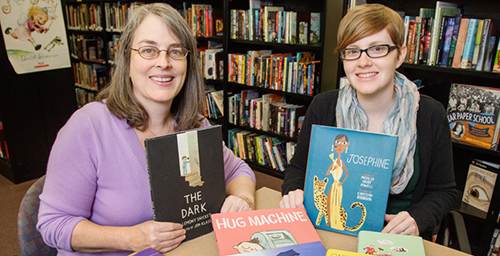 Deborah Stevenson, left, editor of The Bulletin of the Center for Children's Books and director of the Center, and Kate Quealy-Gainer, assistant editor of the Bulletin, with some of the books featured in the 2014 Guide Book to Gift Books. The guide offers suggestions of books to give to children. CHAMPAIGN, Ill. - The Christmas lists of youngsters will likely be filled with their share of video games and other electronics. But good-old-fashioned books (and e-books) hold their own as items to both give and receive, especially if they include an intriguing villain, a hen-pecked superhero or a girl who sells graves for the family cemetery business. The 2014 Guide Book to Gift Books, published by the Center for Children's Books at the University of Illinois, offers suggestions for books in a wide range of styles, genres and subject matter, "whether you're looking for a cheerful picture book, an absorbing nonfiction title or a pulse-pounding novel." It is available for download from the Center's website. The guide is compiled by Deborah Stevenson, editor of The Bulletin of the Center for Children's Books and director of the Center, and Kate Quealy-Gainer, assistant editor of the Bulletin, with help from the reviewing staff. It is produced annually in time for the holiday gift-giving season and includes about 300 titles. About 100 of them are books published within the last year, and all were reviewed favorably in the Bulletin. The guide is divided into sections for picture books, and books for young readers (grades 1-3, ages 6-8), middle readers (grades 4-6, ages 9-11) and older readers (grades 7-12, ages 12-18). Each title also lists a suggested age range for which the book is likely appropriate. Stevenson and Quealy-Gainer said it is a challenge to narrow down the 900 to 1,000 books reviewed each year to the 100 new titles to be included in the guide. They look for a wide range of fiction and nonfiction, a good number of additions for each age group, and diversity in content, protagonists, genre and settings. They also respond to genres or subjects that are popular. "One of the things I like to think about is, who gives gifts?" Stevenson said. "Sometimes it's the affectionate, reverential aunt. And sometimes it's the goofy, devil-may-care aunt who wants to teach you how to blow up potatoes in the microwave. "I want this to appeal to all kinds of gift givers, as well as all kinds of recipients. Ideally, it's a fun thing to give a book, too," she said. This year's guide includes a strong showing of nonfiction. For example, there's the picture book "Gravity," by Jason Chin, which explores the concept of gravity for young children, and "The Family Romanov: Murder, Rebellion and the Fall of Imperial Russia," by Candace Fleming, aimed at teens. It was also a good year for poetry, Stevenson said, and the guide includes two nonfiction memoirs in verse form. "How I Discovered Poetry," by Marilyn Nelson, tells the author's story of growing up, set against the backdrop of the growing civil rights movement. "Brown Girl Dreaming," by Jacqueline Woodson, reminds readers of how powerful encouragement from an adult is to a child. Quealy-Gainer noted a couple of mystery/thriller books she liked. "Fake ID," by L.R. Giles, features a protagonist in witness protection, trying to solve a mystery in his new town. "The mystery is really compelling, but the voice is so edgy and sharp and biting," Quealy-Gainer said. "There's a sensibility that older teens can relate to." She described "The Glass Sentence," by S.E. Grove, for middle readers, as a book in the tradition of "Harry Potter" and "The Golden Compass." "There's a really intriguing villain who is both terrifying and manages to evoke sympathy at the same time," Quealy-Gainer said. Two picture books that Quealy-Gainer described as "delightful." "Naked!" by Michael Ian Black, describes a young boy's "joyful quest to keep the clothes off for as long as possible" following a bath. The special talent of the boy in "Hug Machine," by Scott Campbell, is his hugs. "The Summer I Saved the World ... in 65 Days," by Michele Weber Hurwitz. A girl entering adolescence decides to spend her summer performing a small act of kindness each day. "The Life and Times of Benny Alvarez," by Peter Johnson. A seventh-grade boy must deal with the challenges of middle school and home life. "Six Feet Over It," by Jennifer Longo. A teen helps with the family business - running a cemetery. "The Shadow Hero," by Gene Luen Yang, the story of an Asian American superhero from the 1940s golden age of comic book superheroes. The mother in the story wants her son to be a superhero, Stevenson said. "He's kind of hen-pecked into superheroism," she said. "This One Summer," by Mariko Tamaki. A coming-of-age story about an adolescent girl. "It's a wonderful evocation of summer life," Stevenson said. "You can hear the screen door slamming, and the sand being dropped around." Both the Bulletin and the Center are part of the Graduate School of Library and Information Science.